With a stay at Castelli in Patmos, you'll be within a 15-minute walk of Patmos Cruise Port and Skala Marina. This hotel is 1.2 mi (1.9 km) from Meloi Beach and 1.5 mi (2.4 km) from Cave of the Apocalypse. A contemporary 5-star hotel, Patmos Aktis Suites and Spa is found right by the beach, overlooking Grikos Bay and the island of Tragonisi. The hotel serves an authentic Greek breakfast and has a chic bar and restaurant and traditional Taverna, as well as a stylish boutique, a fitness room, indoor and outdoor pools, contemporary spa and nail salon and both on-site parking and a pier. All rooms have a pillow menu, beach accessories, electronic safes, toiletries and wi-fi access. the Greek local hotel tax of 4€ per room per night (for 5*hotels) will take effect for 2018, the tax needs to paid at the hotel upon arrival. Grab a bite from the snack bar/deli, or stay in and take advantage of the hotel's room service (during limited hours). Unwind at the end of the day with a drink at the bar/lounge or the poolside bar. 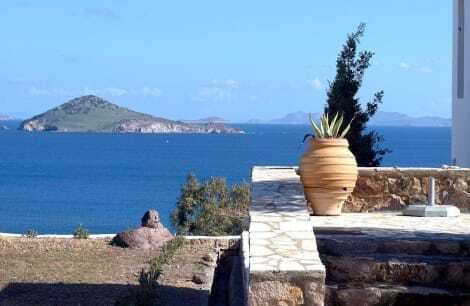 lastminute.com has a fantastic range of hotels in Patmos, with everything from cheap hotels to luxurious five star accommodation available. We like to live up to our last minute name so remember you can book any one of our excellent Patmos hotels up until midnight and stay the same night.